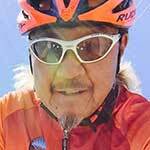 August with its hot daytime temps and thunder showers is the Dog Days of Summer when it comes to bicycling events in Nevada. Still, August is still a great time to get out and ride, no matter where you are in Nevada. 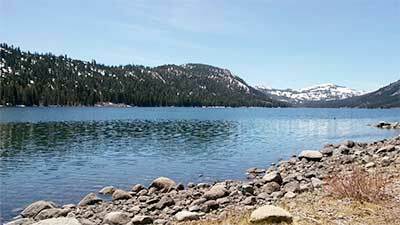 Road Biking in Northern Nevada and around the Lake Tahoe region gets a little concerning with the thousands of daily summer tourists visiting and enjoying the diversity of activities offered. There are several options to continue to ride and train for September events in and around our region as the roadways around Lake Tahoe are jammed with traffic, trucks pulling boats and trailers, and visitors distracted by the beauty of the Lake and not paying attention to the roadway and bicyclists. 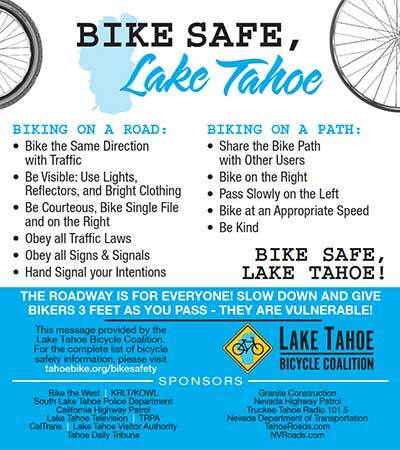 The Lake Tahoe Bicycle Coalition, has assumed the responsibility of promoting safe riding and motoring on roadways and bike paths around Lake Tahoe and continues to fund and promote its “Bike Safe – Lake Tahoe!” summer bicycle safety campaign. The Bike Safe – Lake Tahoe campaign is a multi-media advertising and public service campaign that includes radio announcements on two Tahoe area radio stations in South Lake Tahoe and in Truckee; Television commercials and guests interview appearances on Lake Tahoe TV; and posters and printed rack cards that are printed in both English and Spanish and distributed to all bike shops, hotels, retail outlets, etc. around Lake Tahoe, Truckee, Carson Valley, Carson City & Reno. I went into Great Basin Bicycles to chat with Rich Staley asking what was hot in bikes for 2018. Gravel bikes were at the top of the list along with mountain hardtails and full suspension trail bikes. 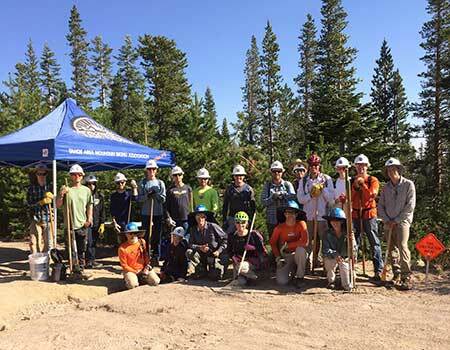 The Lake Tahoe Bicycle Coalition is dedicated to “Make Lake Tahoe More Bicycle Friendly”. You can get more information to support the organizing and become a member here and you can review the Bike Safe – Lake Tahoe! Campaign’s television, radio and printed materials here. The Nevada Department of Transportation announced that U.S. 50 is Nevada’s first official U.S. Bicycle Route (more below). Other roadways in Northern Nevada that have less traffic during the summer months is Foothill Road in the Carson Valley. Lots of road bikers park at Mormon Station State Park in Genoa, or the bottom of Foothill and Hwy 207 (Kingsbury Grade) and ride west towards Woodfords, around Diamond Valley or up Hwy 89/4 to Markleeville with climbs up Monitor Pass and Ebbetts Pass. Alta Alpina Cycling Club has weekly group rides and other activities. 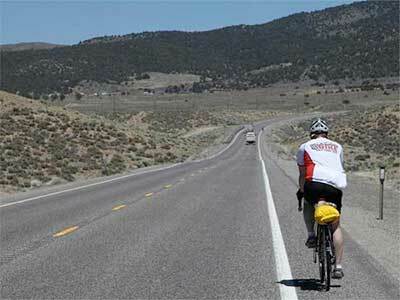 With the completion of Hwy 580, Reno and Carson City road bikers now have Old Hwy 395 through Washoe Valley and the Washoe Lake area, wide open for safer riding. Nice loop with a lot less traffic and good roadway surfaces. For more info you may want to ride with the Procrastinating Peddlers. For mountain biking, the Infamous Flume Trail (left, photo by Brenda Ernst) is accessible from Spooner Lake State Park near Hwy 50 & Hwy 28; or can be accessed from the Incline Village side from Tunnel Creek Café & Flume Trail bikes. 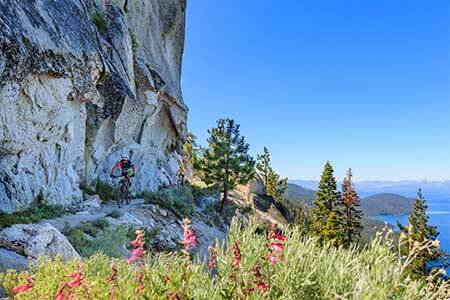 Mountain bike & hiking trails are also accessible in the Carson Valley and Carson City areas that are built and maintained by the Carson Valley Trails Association and although the trails get dusty and loose in the summers, the welcomed thunder showers and rain help wet pack the trails. I do recommend checking weather before you head out on the road or mountain bike trails to make sure you don’t get caught under a thunder shower with possible hail stones and flash flooding down the drainages, to say nothing about mud. In Southern Nevada there are open roadways away from the busy streets of Las Vegas that provide great terrain and a little less traffic. Most riders during the summer months get out extra early in the mornings to ride from 5 am to about 9 am before the temps get over 100 degrees. One great and scenic ride is off Charleston Boulevard out to Red Rock Canyon National Conservation Area and the Loop. 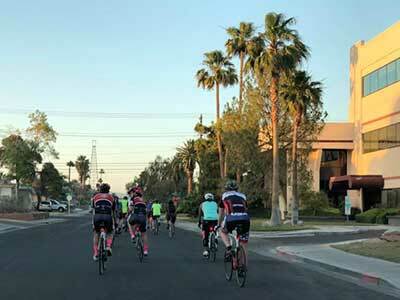 For more in on riding in the Las Vegas area, The Las Vegas Valley Bicycle Club is a good resource to check on early morning or weekend rides with club members. September is full of events, so keep riding the roadways and trails. Enjoy what Nevada has to offer and Be Safe! The Nevada Department of Transportation announced that U.S. 50 across the state has been designated as Nevada’s first official U.S. Bicycle Route, joining the world’s largest network of national bike routes and expanding tourism and long-term economic potential for local communities along the route. 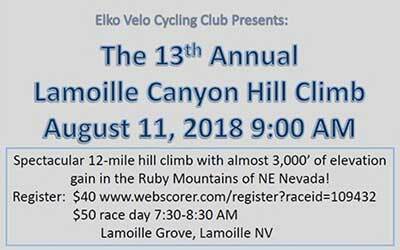 Elko Velo is hosting the 13th Annual Lamoille Canyon Hill Climb on Saturday, August 11. Register and participate in this 12 mile, 3000 vertical ascent.